It’s the middle of the night, and two paper mice find adventure—and each other—as they explore their new home in this beautifully written, stunningly illustrated story of friendship. With a snip and a clip, two paper mice are made. They are given names: Della and Ralph. Each alone, they explore their new house in the dark. Della dashes up the stairs; Ralph skitters through the dining room. There is so much to see and so much to discover! But a big, dark house can be scary for those so small, until they find…each other. 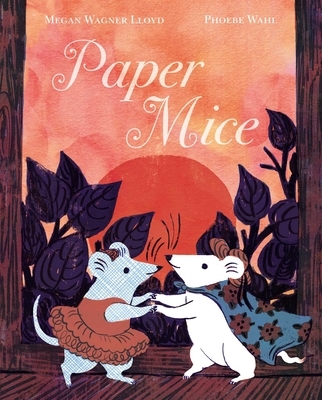 Beautiful, cut-paper illustrations bring to life this lyrical story of adventure and friendship. Megan Wagner Lloyd’s debut picture book, Finding Wild, was called “sparkling” by Publishers Weekly, and her latest, Fort-Building Time, was called “playful reading fun” by Kirkus Reviews. Megan lives with her family in the Washington, DC, area. Visit her online at MeganWagnerLloyd.com. Phoebe Wahl’s first picture book, Sonya’s Chickens, was the recipient of the Ezra Jack Keats Book Award for New Illustrator, as well as a Kirkus Reviews star, and was listed by School Library Journal, Kirkus Reviews, and Huffington Post as one of the best children’s books of the year. Her latest, Backyard Fairies, was called “delightful” by Kirkus Reviews. Phoebe graduated from Rhode Island School of Design in 2013 with a BFA in illustration and currently lives in Washington state. Learn more at PhoebeWahl.com. “With a snip and a clip,/ and a clip and a snip” an elderly woman and a girl craft two paper mice from a security-lined envelope and a sheet of white paper. The mice, christened Ralph and Della, are “placed between the pages/ of two books, pressed flat, and put away.” After the house settles into sleep, the mice awaken from their literary slumber and, each unaware of the other, explore the quiet house, dashing across piano keys, investigating the pantry, and, just like Hunca Munca before them, discovering a perfectly sized dollhouse. It’s only when Della spots Ralph drying himself in front of the fireplace’s embers and saves him from an errant spark that the mice truly begin to enjoy their nocturnal adventures: “Out into the darkness they’d each ventured—alone—/ and found true comfort: a friend.” Wahl creates a comfortably cluttered domicile and a visually engaging nighttime playground in layered illustrations populated with patterned textures and cozy details—clothes dry near the fireplace, and a well-stocked pantry promises fulfillment. Quiet and unpretentious, this simple story of charmed mice offers a sweet depiction of companionship and creature comforts. Playful language with a cheery rhythm describes their adventures and occasionally reveals their thoughts. Della is delighted to discover a dollhouse (and clothes). Ralph explores the kitchen and sets his sights on a loaf of bread. Once the two mice meet, their enjoyment multiplies. The illustrations are dark, befitting the nighttime setting. Created with both physical (watercolor and cut paper) and digital media, the repeating elements, worn-looking textures, and a limited palette of mostly reds, blues, and purples combine to resemble traditional block printing. There are plenty of details to pore over as the mice explore. Humorous touches include a face-to-face meeting between Della and a rubber duck and a "Cap Caraway" album cover, among others. . . . May wind up being a favorite—and even inspire some artwork of their own.